Lakme Fashion Week 2018 is currently the most trending topic in the fashion market and why will it not be? As it celebrates numerous designers on a larger scale. 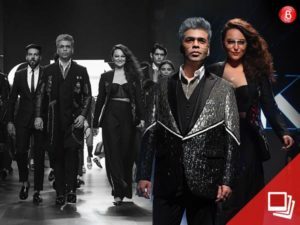 With many stars turning showstoppers for the event, on Day 3, Karan Johar and Sonakshi Sinha walked the ramp for designer duo, Falguni and Shane Peacock. The post LFW 2018 Day 3: Karan and Sonakshi take Centrestage in BLACK, GREY and GLITTER appeared first on Bollywood Bubble.